Since I graduated from Art School, I’ve been fortunate to have lived in many far-flung areas of this country. One of the first things I liked to do upon moving to a new city was research the history of baseball in each place. In a metropolis like Baltimore or Chicago, that was very easy, since both cities have a long documented history with the game. When I took a job in Cincinnati back in the mid-1990’s, I chose to live across the Ohio River in Covington, Kentucky. Of course I knew about Cincinnati’s long baseball history, but what I didn’t know was that Covington, too, had a very interesting baseball past. Since Covington is a river town, baseball came to town much earlier than other places on the east coast, traveling west with the river boats that steamed out of Pittsburgh. The game was already popular in northern Kentucky in the decade before the Civil War, and it really took off when the boys came home in 1865. While the Cincinnati Red Stockings are very well known for being (arguably) the first all-professional baseball team in 1869, the club disbanded after 1870, and the Cincinnati area was left without a professional team. That’s when baseball-starved businessmen in Covington stepped in and founded the Covington Stars in 1875. This semi-pro team was so popular that rival businessmen across the river took notice and promptly brought pro ball back to Cincinnati in 1876. Now eclipsed by the Reds, the Covington Stars faded away, as did the city’s hopes of a professional ball team. The bustling northern Kentucky cities of Covington, Newport and Bellevue were large enough that it was presumed that they could support a professional minor league team. Of course, the Cincinnati Reds opposed to any team being placed right across the river from their ballpark. Each time one of the northern Kentucky cities tried to field a minor league team, the National Commission, the governing body that ruled all of organized baseball, quickly ruled in favor of the Reds. However, in 1912 the United States League was formed, independent of the National Commission. That meant they could place teams where ever they chose to, and cities such as Covington watched with great interest. 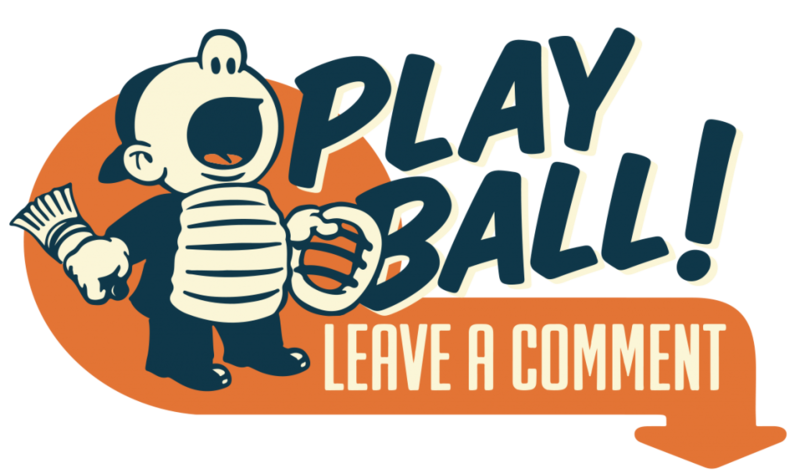 Being an “outlaw” league, the United States League were only able to attract marginal players who for whatever reason were not under contract with a professional team or where banned from playing on teams under the control of the National Commission. After a marginal 1912 season, the name was changed to the Federal League, and more players were lured away from the established minor leagues. To show how serious they were, the new league granted franchises to big league cities St. Louis, Chicago, Cleveland, and Pittsburgh as well as Indianapolis and Covington, Kentucky. With the cities solidified, each club hurried to fill out their rosters. 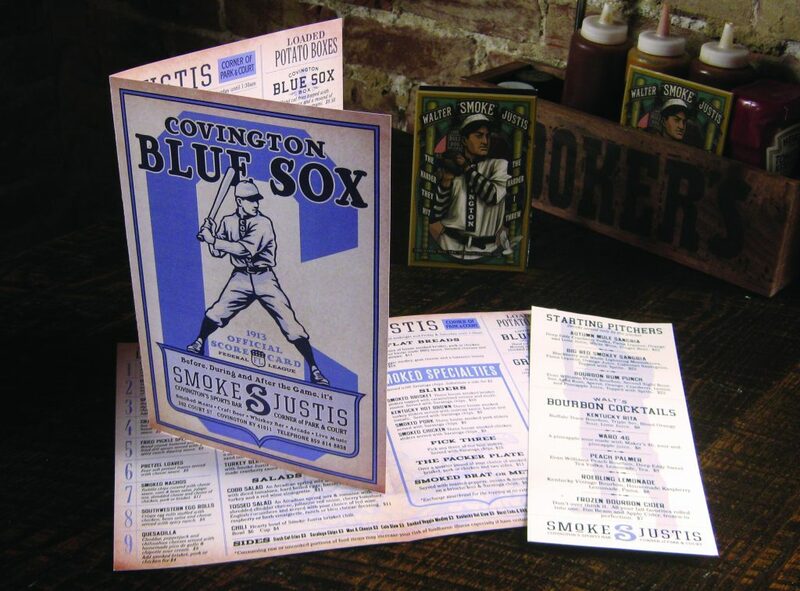 The Covington team, dubbed the “Blue Sox,” signed a few over the hill minor league journeymen and a couple of local boys who had experience playing in Kentucky’s Blue Grass League. Though minor leaguers were all well and good, Covington strived to find a marquee player, someone with big league experience around which to build the team. With his trademark mane of wavy, dark hair, Smoke became well known for his eccentricities, such as incessantly practicing his sliding in hotel hallways and wearing ladies silk stockings under his uniform for luck. While pitching for the Lancaster Lanks, Smoke made history by pitching not one, but FOUR no-hitters during the 1908 season. This incredible feat and his 25 wins that year earned him another chance at the majors with the St. Louis Browns. After a successful spring training in 1909, he made the team, but just before opening day injured his arm while wrestling a teammate. The Browns threw him back to the bush leagues and Smoke never had his second shot at the majors. After pitching for the Dayton Veterans, Jersey City Skeeters and the Holyoke Papermakers, Smoke had reached the bottom of the minor league ladder, with no club willing to take a chance on a thirty year-old sore-armed pitcher. In ordinary times, Smoke would have retired, but 1913 was no ordinary year. With the Federal League trying to gain quick respectability, a cagey veteran with (albeit short) big league experience was quite a catch. Because the franchise was awarded last minute, the city of Covington had to scramble to build a ballpark. Although rather bare-boned and reputed to be one of the smallest in professional baseball, Federal Park was completed in time for the start of the 1913 season. The city of Covington declared Opening Day a holiday, and a pre-game parade of the Blue Sox team led the fans to the ballpark. Carrier pigeons were released at home plate bringing news of the new season to each city in the Federal League. Smoke endeared himself to the Covington fans by throwing a shutout against the Pittsburgh Terriers. Smoke Justis hung up his spikes after the 1913 season and returned to Indiana where he, among other things, worked in a Bourbon distillery. 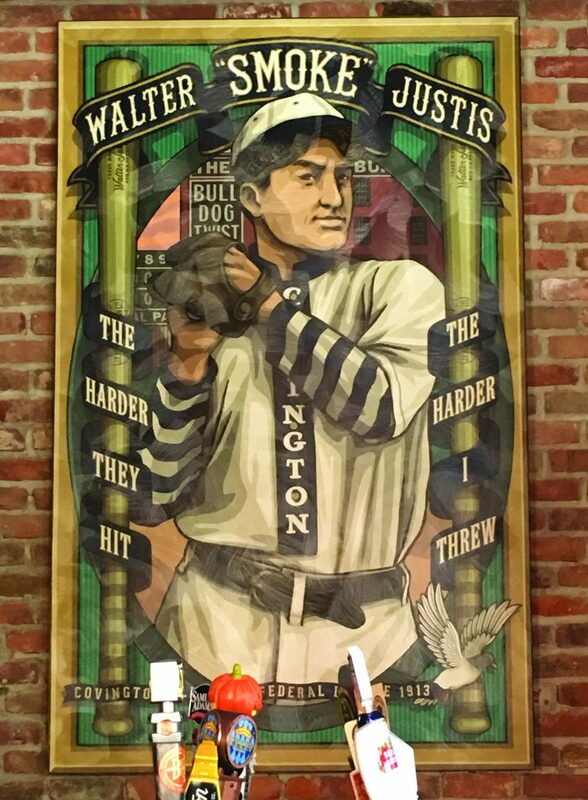 The old right-hander passed away in 1941 at the age of 58. If you’re in the area, I highly recommend the smoked wings, they are a real treat. And if you haven’t already, parking in Covington and walking over the old Roebling Bridge to a Reds game is one of those lesser-known baseball experiences one should make a point of doing during their lifetime, made all the more pleasurable since a fan can go to a place like Smoke Justis both before and afterwards. Besides, when the heck will you ever find another Federal League themed bar in your lifetime?